* Initial predictions of long ORFs are used as a starting point for calculating parameters for gene prediction. Iterates until stabilizes. Generates parameters such as 5th-order in-frame Markov chains for coding regions, 2nd-order Markov models for region around start codon and upstream RBS site, stop codon and probability distributions of ORF lengths. ** Add names of homologs from COG/NR/KEGG to deflines of predicted proteins. *** In upstream and downstream regions, correspondingly, of predicted genes. BTERM is the program predicting bacterial-independent terminators with energy scoring based on discriminant function of hairpin elements. g)	Appendix. Running gene/operon prediction steps in manual mode. Actual scripts. To identify protein and RNA genes in bacterial genomic sequences or environmental samples, Softberry developed Fgenesb_annotator pipeline that provides completely automatic, comprehensive annotation of bacterial sequences. The pipeline includes protein, tRNA and rRNA genes identification, finds potential promoters, terminators and operon units. Predicted genes are annotated based on comparison with known proteins. The package provides options to work with a set of sequences such as scaffolds of bacterial genomes or short reads of DNA extracted from a bacterial community. The final annotation can be presented in GenBank form to be readable by visualization software such as Artemis  and Genome Explorer (fig. 1 and 2). The gene prediction algorithm is based on Markov chain models of coding regions and translation and termination sites. For annotation of mixed bacterial community, we use special parameters of gene prediction computed based on a large set of known bacterial sequences. Operon models are based on distances between ORFs, frequencies of different genes neighboring each other in known bacterial genomes, and information from predicted potential promoters and terminators. The parameters of gene prediction are automatically trained during initial steps of sequence analysis, so the only input necessary for annotation of a new genome is its sequence. Optionally, parameters from closely related genomes can be used, instead of training new parameters. Bacterial gene/operon prediction and annotation requires, besides Fgenesb_annotator programs and scripts, BLAST, NCBI Non-Redundant database (NR), and a file reconstructed from COG database . RRNA genes are annotated using BLAST similarity with all known bacterial rRNAs database. For prediction of tRNA genes, the pipeline uses tRNAscan-SE package . 1. K. Rutherford, J. Parkhill, J. Crook, T. Horsnell, P. Rice, M-A. Rajandream and B. Barrell (2000) Artemis: sequence visualisation and annotation. Bioinformatics 16 (10) 944-945. 2. Tatusov RL, Natale DA, Garkavtsev IV, Tatusova TA, Shankavaram UT, Rao BS, Kiryutin B, Galperin MY, Fedorova ND, Koonin EV. (2001) The COG database: new developments in phylogenetic classification of proteins from complete genomes. Nucleic Acids Res. 29, 22-28. 3. Lowe, T.M. & Eddy, S.R. (1997) "tRNAscan-SE: A program for improved detection of transfer RNA genes in genomic sequence", Nucl. Acids Res., 25, 955-964. Automatic annotation of predicted genes by homology with protein databases such as COG, KEGG, NR and/or custom protein databases. Fgenesb correctly identified 10-30% more reference genes on the contigs than the Critica-Glimer pipeline in every data set of contigs. 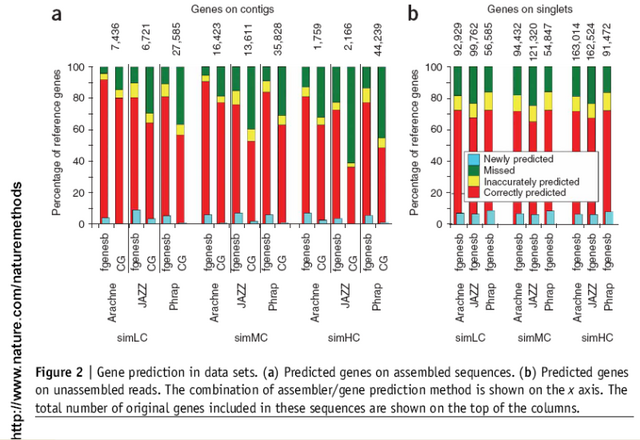 Fgenesb correctly identified ~70% of reference genes on unassembled reads in all data sets (unassembled reads are typical for bacterial community sequencing) The Critica-Glimmer pipeline exhibited poor results: only 7% genes was accurately predicted. 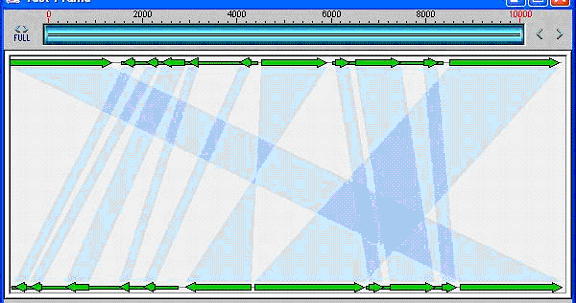 Bacterial Genome Explorer to work with annotations and comparison of genomes. The package includes options to work with a set of sequences such as scaffolds of bacterial genomes, or short sequencing reads extracted from bacterial communities. For community sequence annotation, we developed ABsplit program that separates archaebacterial and eubacterial sequences (available separately). Final annotation can be presented in GenBank format to be readable by visualization software such as Artemis or Softberry Bacterial Genome Explorer (fig. 1 and 2, GenBank parser is available separately). 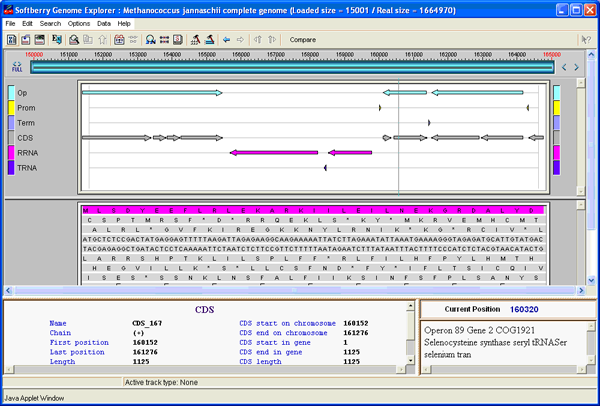 Comparison of two bacterial genomes view of Genome Explorer. 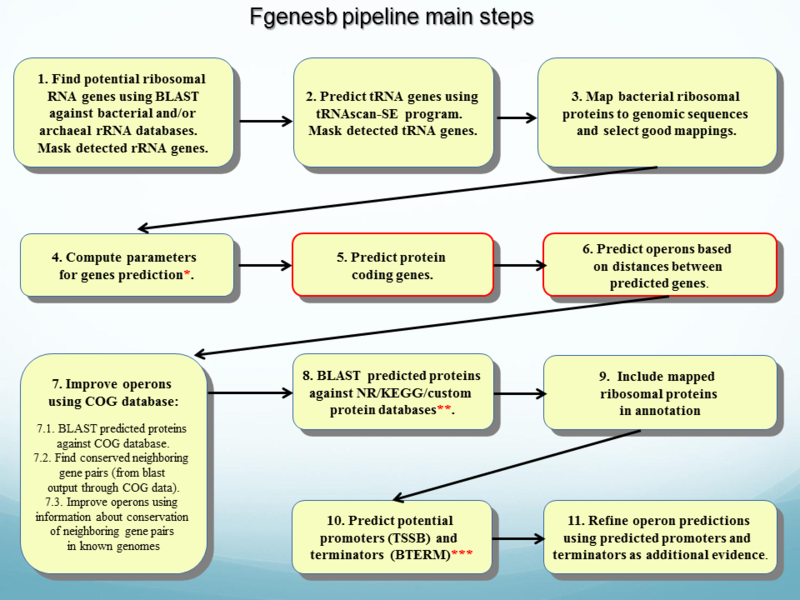 Main Steps of FGENESB annotation. Many steps are optional and can be switched ON/OFF in configuration file. STEP 3. Mapping bacterial ribosomal proteins to genomic sequences and selecting good mappings. STEP 4. Initial predictions of long ORFs that are used as a starting point for calculating parameters for gene prediction. Iterates until stabilizes. Generates parameters such as 5th-order in-frame Markov chains for coding regions, 2nd-order Markov models for region around start codon and upstream RBS site, stop codon and probability distributions of ORF lengths. STEP 5. Predicts operons based only on distances between predicted genes. STEP 7. Finds conserved operonic pairs from blast output through cog data. STEP 8. Uses information about conservation of neighboring gene pairs in known genomes to improve operon prediction. STEP 9. Runs BLAST for predicted proteins against protein databases such as KEGG, NR and/or custom protein databases. STEP 10. Adds names of homologs from COG/KEGG/NR/etc. (found through BLAST) to annotation file (file with prediction results). STEP 11. Predicts potential promoters (TSSB1 program) or terminators (BTERM) in upstream and downstream regions, correspondingly, of predicted genes. BTERM is the program predicting bacterial-independent terminators with energy scoring based on discriminant function of hairpin elements. STEP 12. Refines operon predictions using predicted promoters and terminators as additional evidences. FGENESB gene prediction engine is one of the most accurate prokaryotic gene finders available: see Table 1 for its comparison with two other popular gene prediction programs. Table 1. Comparison of three popular bacterial gene finders. Accuracy estimate was done on a set of difficult short genes that was previously used for evaluating other bacterial gene finders (http://opal.biology.gatech.edu/GeneMark/genemarks.cgi). First set (51set) has 51 genes with at least 10 strong similarities to known proteins. Then 72set has 72 genes with at least two strong similarities, and 123set has 123 genes with at least one protein homolog. Here are the prediction results on these three sets for GeneMarkS and Glimmer (calculated by Besemer et al. (2001) Nucl. Acids Res. 29:2607-2618) and FGENESB gene prediction engine (calculated by Softberry). All prediction components of FGENESB are extremely fast (minutes per genome). The limiting stage is BLAST annotation, which for E.coli genome takes around 12 hours on a single processor. Using multiple processors and corresponding BLAST would speed up annotation proportionally. /function="ATPases involved in chromosome partitioning"
For each genomic sequence (complete genome, scaffold, read, etc.) the program lists locations of predicted ORFs, rRNAs, tRNAs, promoters and terminators. ORFs are labeled as CDS and provided with their order number in a sequence and an indicator of whether they are transcribed as a single transcription unit (Tu) or in operons (Op) (of course these are predictions). If an ORF has a homolog, its short name is provided after a "##" separator (here name of only one homolog - either from COG, KEGG, or NR - is given; best homologs from all databases are listed in ID lines of predicted proteins, see below). is description for predicted gene number 5 in 4th Operon with coordinates 2737 - 3744 in the '+' strand and it is the second gene in operon. Coding chain for this CDS (+) means a direct chain, (-) means a complementary chain. 871 is a score of gene homology assigned by BLAST. COG0673 is an ID of its homolog from the COG database. In other words, first column lists an ordered number of predicted CDS, starting from beginning of a sequence; second column - number of predicted operon/TU, and fourth column - number of gene in an operon (always 1 for a TU). Here, in 4/0.002, 4 is a number of observations of this gene being next to one of its neighbors on known bacterial genomes (we call it N-value), while 0.002 is a P-value, an empirical probability of observing N occurrences of genes being adjacent by random chance. P is a very approximate measure. For all P<0.0001, the value in output is 0.000. At the end of annotation, we also provide protein products of predicted genes in fasta format, with full name of homolog and homology scores according to BLAST. While looking a bit complex for a human eye, it is well suited for parsing by a program. Then, complete ID lines of homologs are given preceded by DB names where they were found by BLAST (e.g., NR:) and followed by statistics from corresponding BLAST outputs. If you run mapping of ribosomal proteins to sequences with option "allow frameshifts / internal stop codons", predictions with frameshifts, if any, are noted with keyword "orf_shift", and predictions with internal stop codons, if any, are noted with keyword "orf_stop". rRNAs are labeled as LSU_RRNA (large subunit), SSU_RRNA (small subunit) or 5S_RRNA (5S), tRNAs as TRNA, promoters as Prom, and terminators as Term. Promoters (their coordinates and scores) are reported by TSSB1 program. Main script - bamg.pl - runs all steps of training, gene prediction and annotation for a given sequence (or a set of sequences). <parameter file> - file with parameters for gene prediction (optional). Some lines may be subdivided into fields (by separators ' ## '). The same lines from "ba_paths.list" are shown in the table below in the 2nd column, with the numbers of lines indicated in the 1st column. Content of each line is explained after the table. Note: in the example the number of other databases for BLAST is set to 2 and those databases are KEGG and NR. If you want to use more/other protein DBs for annotation, provide the number of DBs and list DBs with required parameters (name and BLAST mode) on the following lines. /home/fgenesb/DATA/rbp_db/nr_bact_rbp      ## NR  ## 1  ## 1 ## ribos. prot. second field - threshold number for predicted genes. First, genes are initially predicted using general gene finding parameter file given in this line. Second, if the number of predicted genes is more than the threshold number given in the line, then automatic training of gene finding parameters is involved and genes are re-predicted based on automatically generated parameters. Otherwise, if the number of predicted genes is quite small (less than the threshold number), training parameters for gene prediction is not reliable and is not involved. Note: in this example the number of other databases for BLAST is 2 and those databases are KEGG and NR (lines 18, 19). If you want to use more or other protein DBs for annotation, put the number of DBs on this line and list DBs with required parameters (name and BLAST mode) on the following lines. Note: when converting predictions from Fgenesb to Sequin format, gene names and EC numbers for predicted genes are assigned from KEGG homologs (if such are found) and protein names are assigned either from KEGG or NR homologs. Therefore, if you are planning to submit genome annotation to GenBank, it is recommended to blast all predicted proteins against KEGG (mode 1 for KEGG). When mapping proteins to sequences, ORFs with frameshifts or/and internal stop codons can be predicted. Predictions with frameshifts are noted with keyword "orf_shift", and predictions with internal stop codons are noted with "orf_stop". Then analyze ORFs with frameshifts / internal stop codons in Fgenesb output, adjust sequences of contigs so that there will be no such frameshifts / internal stop codons upon the next run, and re-run Fgenesb annotation on changed contigs. Otherwise, if contigs are not adjusted and ORFs with frameshifts or/and internal stop codons are present in the output, converter "tosequin.pl" will skip such genes with errors upon conversion of predictions from Fgenesb to Sequin format. Installation is simple, and the only problem that sometimes happens is that executables are not compatible with the user's operation system. The easiest solution is to open temporary account where we can compile, install and test FGENESB on your system. In addition to software/data from the distribution files, you will need to install BLAST software (and NR protein database if you are going to use it in annotation). Use BLAST release 2.2.13 or some higher version. See "KEGG_prepare.txt" from FGENESB/KEGG/ directory for how to prepare and install KEGG database for use with FGENESB. ba_ar_paths.list    - for annotation of mixed bacterial + archaebacterial seq. Edit configuration files - provide paths to software/data you have installed and options to run FGENESB system. 90              - minimal length of predicted genes in nucleotides. The system is installed correctly if the output file 'test.out' is similar to 'test.res' (located in TEST/ directory) and no ERROR messages appear. Now you can run the system on your sequence or a set of sequences, e.g., by replacing 'test.seq' with an appropriate file in the command above. if you want to run several annotations in parallel, run each sequence, or a set of sequences, from a separate directory. If you make predictions in short contigs, gene finding parameters training procedure is not involved (because there is not enough data for training). In this case, either generic or pretrained gene finding parameters can be used for gene prediction. You should indicate one of them in configuration file (for example, in "ba_paths.list"). FGENESB annotation can be converted to GenBank format by scripts from TOGB/ directory. "header" is file with GenBank Header - you can edit it to put your names and other specific information, or you can use this file without editing but later edit *.gb file. See example of FGENESB output in GenBank format in "Explanation of Fgenesb_annotator output". FGENESB annotation can be converted to Sequin format (for submission to GenBank, after annotation is complete) by scripts from TOSQ/ directory. See "tosequin.txt" from TOSQ/ for details. As an alternative to automatic annotation, you can run each step separately in manual mode. (Here exemplified by annotation of NC_001264.fna). Finds all potential ribosomal RNA genes using BLAST against precompiled bacterial and/or archaeal rRNA databases. First, given genomic sequence is blasted against defined rRNA databases and rRNA genes are detected. Then detected rRNA genes are masked so that they do not interfere with subsequent prediction of protein-coding genes. At a later stage (see bactg_ann.pl) scripts rna_annot.pl (for bacterial rRNA) and ra.pl (for archaeal rRNA) put non-redundant, non-overlapping rRNA genes in the final annotation file. Predicts tRNA genes using tRNAscan-SE program. Detected tRNA genes are masked so that they do not interfere with subsequent prediction of protein-coding genes. At a later stage (see bactg_ann.pl) script trna_annot.pl puts predicted tRNA genes in the final annotation file. STEP (after 2, before 3). Mapping bacterial ribosomal proteins to genomic sequences and selecting good mappings. mgpa.pl makes parameter file and makes first prediction, without predicting operons (iterative procedure). morfs - ab initio gene prediction using precomputed parameters such as 5th-order in-frame Markov model for coding regions, averaged 2nd-order Markov model for region around start codon and upstream RBS site and probability distributions of ORF lengths. mgpa.pl uses only genome sequence and optionally non-canonical genetic code specified as the translation table number at NCBI, default is 11 (canonical code). Of 86 annotated bacterial genomes, 81 have standard code with three stop codons (code 11), and five, for example M.genitalium and M.pneumonia, have two stop codons (code 4). Script has two output files: <output> which is similar to gene prediction output of FGENESH (gene coordinates and predicted proteins at the end) and <param.output> which is output file for parameters that can be used for future gene predictions on this and related genomes. This is a first run of morfso in which it predicts operons based only on distances between genes. Runs BLAST for predicted proteins against COG database (cog.pro). Step 5 is optional, if you do Step 5, then do Steps 6,7, otherwise skip them. oppr.pl - finding conserved operonic pairs from blast output through cog data. Makes output with pairs of adjacent genes in the same strand which also occured adjacently in other 43 cog genomes, and puts number of occurences of pairs in the genomes and P-value, probability of observing by random chance. It uses two files: genes list - cog_gene.list and organisms list - org.list. Second run of morfso which now uses information about conserved pairs to improve operon prediction. Runs BLAST for predicted proteins against KEGG database. Runs BLAST for predicted proteins against NR database. Adds names of homologs from COG/KEGG/NR (found through BLAST) to annotation file (file with prediction results). Last two parameters, <BLAST MODE> and <blast output>, must be repeated 3 times to indicate parameters for COG, KEGG, NR, respectively. pta.pl - predicts potential promoters (tssb1) or terminators (bterm) in corresponding 5'-upstream and 3'-downstream regions of predicted genes, if there are no close genes in the neighborhood at the same strand. After that puts predicted promoter and terminator positions in the annotation file. tssb1 - bacterial promoter prediction (sigma70) using discriminant function with characteristics of sequence features of promoters (such as conserved motifs, binding sites, etc.). bterm - prediction of rho-independent terminators as hairpins, with energy scoring based on discriminant function of elements of hairpin. ref_opp.pl - refinement of operon predictions in the annotated file, using predicted promoters and terminators as an additional evidence. (exemplified by annotation of seq. NC_001264.fna). Copy programs/scripts to STEPS/ directory if you want to run annotation is steps, e.g., /home/fgenesb/STEPS/. Many steps are optional. Here we give one variant of running the pipeline in steps. These steps require only a sequence file as an input, so it is easy to put them in a batch file and run by a single command, as we do using main script bamg.pl, but doing annotation in steps makes spotting errors easier and also allows to use non-standard genetic code.